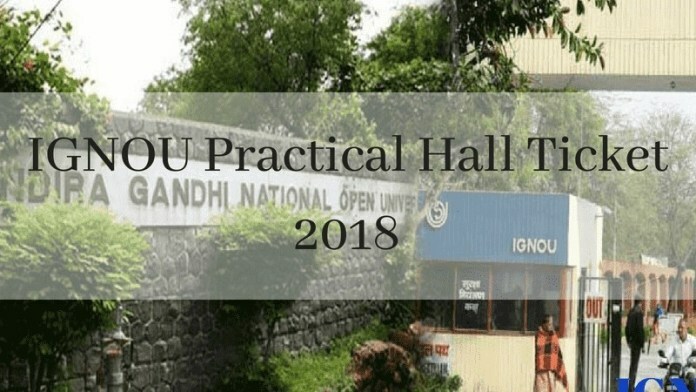 IGNOU Practical Hall Ticket 2018 – IGNOU has released term end practical exam hall ticket. Students can download IGNOU Practical Hall Ticket 2018 through the link provided on this page. To download IGNOU Term End Practical Admit Card candidate enrollment number is required. Indira Gandhi Open University is conducting TEP Dec 2018 Exam in the month of January 2019, at the various regional centre. The University is conducting practical exam for BCA / MCA / CIT / CBS and other courses. IGNOU Practical Hall Ticket is important to appear in the practical exam. No students will be allowed to appear in the exam without the hall ticket, so make sure you download the IGNOU Practical Amit Card 2018 within the deadline of downloading the same. Carry your original IGNOU ID card along with the Practical Hall Ticket. To know IGNOU Practical Exam Centre details check the hall ticket. Students can collect their Practical hall ticket from the regional centre. Students should check the name, enrollment no and course name on the hall ticket. Check the table for IGNOU Practical Hall Ticket 2018. IGNOU Practical Hall Ticket: Candidates can download IGNOU Practical Hall Ticket 2018 from their respective Regional website. Students can download IGNOU Practical Hall Ticket 2018 for Practical Exam June 2018. Students can follow the steps to download the Practical Hall Ticket 2018. Then enter the enrollment no. Check the printed details on the hall ticket on IGNOU Practical Hall Ticket. Take the print of the same. Check the printed details on IGNOU Practical Hall Ticket 2018. The student has to appear in the exam for the particular course on a specific date, time slot without fail. If the student fails to appear in the practical exam will be treated as absent for the particular course. Such a student can only appear in the next semester term end practical exam. Duration of the exam is 3 hours for the course marked with * and 2 hours for other courses. Students are required to carry their practical Hall Ticket on the day of the practical exam. The student should also carry a valid identity along with the Practical hall ticket. If the student fails to produce IGNOU Practical Hall Ticket and valid identity card will not be permitted to appear in the exam. The Practical exam centre will not be changed under any circumstances. The student whose attendance is less than 70% in the MCA Revised course and/or less than 75% in other courses, their practical exam will get cancelled without any information. For CIT practical candidates, the students who have attended at least 12 out 18 practical counselling session in CIT-001 are eligible for the Term End Practical Exam.